Sept. 27, 2013, 10:45 a.m.
By Adrienne LaFrance @adriennelaf Sept. 27, 2013, 10:45 a.m.
Editor’s note: In 1882, not long before his 25th birthday, a Wisconsin newspaperman named Lucius Nieman gave his new paper, The Milwaukee Journal, a mission: “The Journal will be the outspoken, independent organ of the people against all that is wrong or unworthy of support in public men and the legislation of the State and nation.” Over the following half-century, he built the Journal into a nationally noted, Pulitzer-winning powerhouse. He died in 1935; the next year, so did his wife. The couple had no children. In her will, Agnes Wahl Nieman left a large part of her estate — which had been built by the Journal’s success — to Harvard to “promote and elevate the standards of journalism and educate persons deemed especially qualified for journalism.” That gift led to the Nieman Fellowships and the Nieman Foundation, of which Nieman Lab is a part. This weekend, the foundation is celebrating its 75th anniversary. We thought it would be a good time to look in on Lucius Nieman’s old daily — now known, after a consolidation of morning and afternoon papers, as the Milwaukee Journal Sentinel. MILWAUKEE — You won’t find any newspapers for sale at the fluorescent-lit convenience store about two blocks from the Milwaukee Journal Sentinel’s downtown headquarters. Ask for a copy of the local daily and you get an apologetic chuckle from the clerk. He instead suggests The Onion, print copies of which are just outside in a rusting metal box. In other cities, this might feel like a tidy metaphor for the plight of the newspaper industry — particularly the metro dailies. Before the web, metros occupied the business’ sweet spot: big newsrooms, a captive audience, and riches flowing in from the classifieds. But in the past decade, they’ve suffered the steepest declines, the biggest cutbacks, the worst losses. But something’s different in Milwaukee. The daily newspaper is actually…kind of…almost…thriving. There’s been plenty of pain along the way: layoffs, buyouts, wage freezes, and advertising declines. The staff is smaller, as it is almost everywhere. But spend time talking to people in the newsroom and you’ll find morale is unusually high. Out in the community, the newspaper has maintained one of the nation’s highest rates of market penetration. And there’s a common thread between those two facts: Through all the financial stress, the paper has maintained — even extended — its commitment to watchdog, investigative reporting. 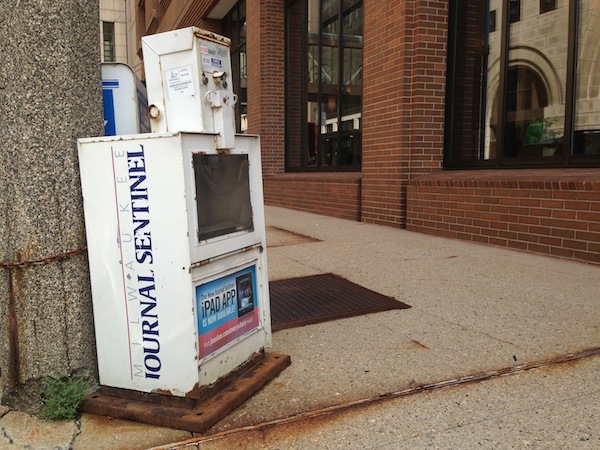 Journalistically, the Journal Sentinel is in a period of real strength. Since 2008 — over what has been the most crushing stretch in American newspaper history — the paper has won three Pulitzers and been finalists three other times. That’s a tally newspapers a lot larger than the Journal Sentinel can only envy. 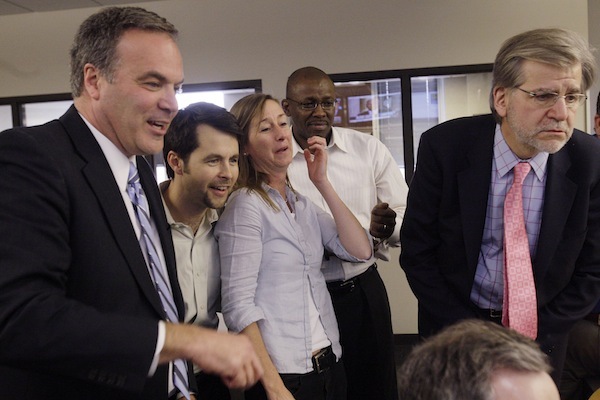 “At the risk of sounding like a Pollyanna, it really feels like we are actually moving toward something new and exciting,” said Dave Umhoefer, an investigative local government reporter who won one of those Pulitzers in 2008. 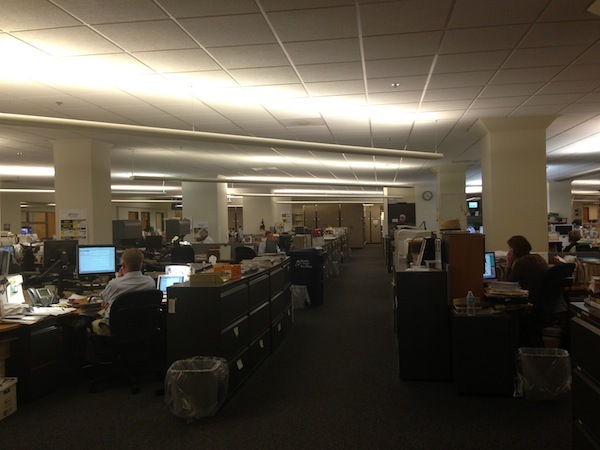 The Journal Sentinel’s story begins with its location. Milwaukee is not an average newspaper town. It’s easy to fall back on Midwestern stereotypes — nice, earnest, civic-minded — but there’s some truth in them. The watchdog heritage started by Lucius Nieman was still alive and well when a young Romenesko was covering the cops beat at the Journal. The paper was flush with cash — for a time, it had a full-time ballet reporter — and it drew attention. The Newsboy, 1888. Carved, assembled and painted wood with folded tin; artist unknown. 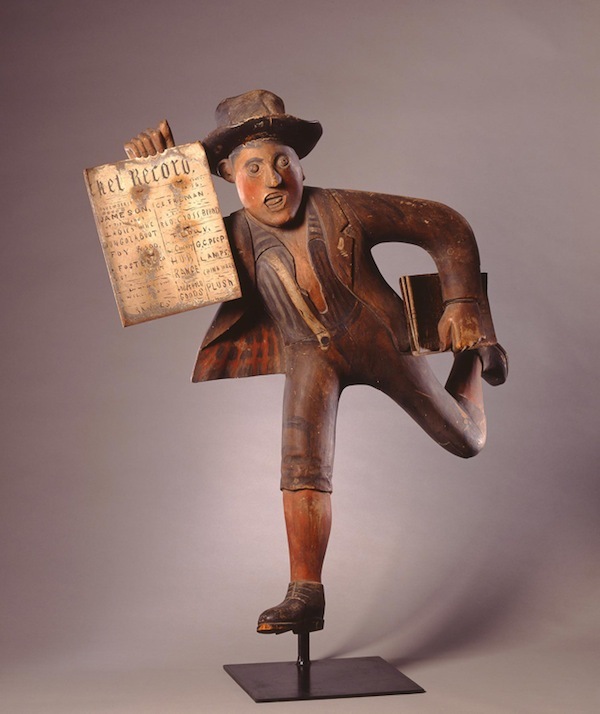 Milwaukee Art Museum, The Michael and Julie Hall Collection of American Folk Art. Photo credit: John Nienhuis. When times got tough in the 2000s, every metro newspaper had to cut staff. Many gutted their investigative capacity along the way. 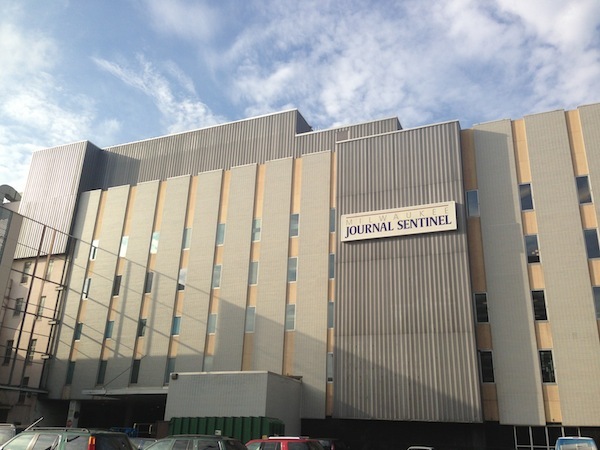 But the Journal Sentinel had a different strategy, building its values into the structure of the newsroom by hiring Mark Katches to create a special watchdog unit in 2006. Katches guided his team to two Pulitzers before leaving for the Center for Investigative Reporting, where he’s the editorial director. While investigative reporters are given time for heavy lifts, the watchdog team was also created with the Internet in mind. The section of the Journal Sentinel’s website dedicated to the Watchdog team’s work also includes quick-hit blog posts, resources for citizens interested in doing their own digging, and a data journalism vertical. The paper’s 2011 investigation into police officers who have broken the law, for example, is paired with an interactive database that allows readers to search by name for an officer’s criminal record. Stanley says giving reporters freedom — and a feeling of being engaged with quality work — is one of the most important steps to keeping staffers happy. “People like to have a lot of say in how they do their job, and they like to have a degree of independence in what they do,” Stanley told me. “People also want to be master craftsmen, they want to be master journalists, they want to be master mechanics. But the most important thing is a sense of purpose larger than ourselves. You want to work for something that matters. Rutledge credited the collaborative atmosphere that allows people with complementary skills to work together. On one story, she had a stack of 1,800 PDFs and wanted to tally one field of data from each record to determine the public burden imposed by a tax subsidy. Counting manually was a waste of time, but no one in government said they had the total. 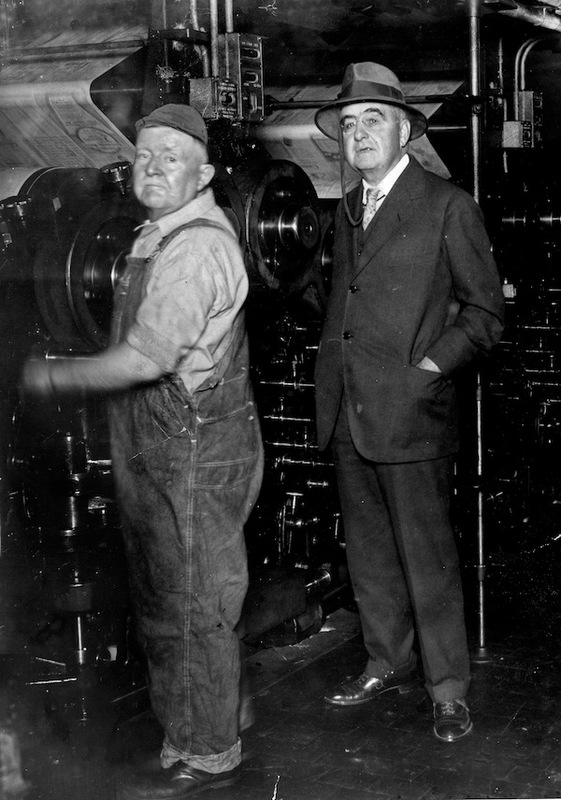 Lucius Nieman (right) visits his printing press. Photo courtesy the Milwaukee Journal Sentinel. But despite the ongoing financial pressures, the focus on watchdog work remains in place. Earlier this month, the paper revealed that it would challenge the local government for access to records in a closed judicial investigation. The probe involves a secret email server that was set up in a county executive’s office so high-level staffers could communicate outside of the regular government email system. This year it published a deep-dive into public assistance fraud, and a remarkable enterprise series about a botched sting by the federal Bureau of Alcohol, Tobacco, Firearms and Explosives. At the newspaper — a short walk from riverfront breweries, an old-fashioned cheese market, and a bronze-and-pewter statue of the Fonz — news meetings are still held in the Nieman conference room, where Lucius’ portrait is on the wall. Journal Sentinel staffers like to joke that the room is so cold because his ghost still hangs out there. But managing editor Stanley thinks conditions are warming. The paper is doing well enough today that he says he’s “very hopeful” it will soon be able to grow its staff again. And although it has found some success during a difficult time for the industry, it hasn’t solved the question of what kind of business model will sustain its journalism in a post-print-advertising world. No one has. Yet Stanley suggests things would have to get really, really bad for the paper to start chipping away at its investigative unit or moving watchdog reporters to other areas of the newsroom. POSTED Sept. 27, 2013, 10:45 a.m.
LaFrance, Adrienne. "What does the Milwaukee Journal Sentinel know that your newsroom doesn’t?." Nieman Journalism Lab. Nieman Foundation for Journalism at Harvard, 27 Sep. 2013. Web. 18 Apr. 2019. LaFrance, Adrienne. "What does the Milwaukee Journal Sentinel know that your newsroom doesn’t?." Nieman Journalism Lab. Last modified September 27, 2013. Accessed April 18, 2019. https://www.niemanlab.org/2013/09/what-does-the-milwaukee-journal-sentinel-know-that-your-newsroom-doesnt/. | title = What does the Milwaukee Journal Sentinel know that your newsroom doesn’t?